Did you know that 180,000 people who are blind or partially sighted rarely leave home alone? At Guide Dogs we are committed to change this and we need your help to do so. Besides training guide dogs, we offer other services that contribute to change the life of blind and sighted people in Scotland. We are currently looking for volunteers in Aberdeen and the surrounding areas to fulfil central roles: Puppy Walkers and My Guide. Whether you have a couple of hours per week or are available full-time, your can make an enormous difference on people’s life. If you are free full-time, maybe you’d be interested in becoming a volunteer Puppy Walker? A Puppy Walker is a challenging yet very rewarding role. You’ll be welcoming at home a puppy and helping them live different experiences that will give them the confidence to be a super guide dog in the near future. Thanks to your help, this puppy will become a guide dog that will give to a blind or partially sighted the confidence to enjoy of the same freedom of movement as everyone else. If you are working but have a couple of hours free, maybe you would to become a volunteer My Guide? 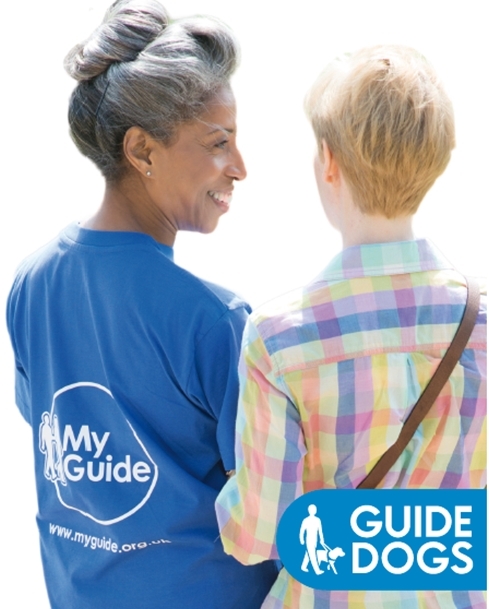 As My Guide you will be supporting a person who is blind or partially sighted for a couple of hours to go out. You’ll be receiving training and on-going support as you are carefully matched to a local person who is blind or partially sighted. Your local staff are there to answer any questions or help as needed. If you are interested in finding out more about the roles of Puppy Walker or My Guide, why not have a chat with Emma our Volunteer Consultant at the Edinburgh Mobility Team? We look forward to hearing from you soon and see how you can help Guide Dogs make a real difference in Scotland. Thank you Scottish Mum for this lovely post. We are looking forward to welcoming more volunteers from Aberdeen and surronding areas!